With Valentines Day rapidly approaching Freedom Alliance is preparing to help service members “feel the love” by sponsoring a variety of holiday activities. Already Freedom Alliance has hosted a pre-Valentines Day party for the 2nd Marines 5th Battalion at Camp Pendleton in Oceanside, California. 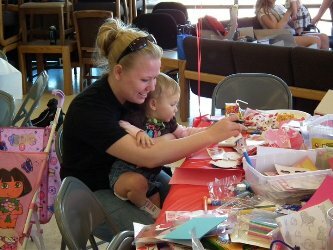 Forty families attended and made care packages not only for their Marines and Sailors but for single service members deployed and on base. Banners were made for each company and arts and crafts supplies were provided for kids to make their own Valentines. Freedom Alliance arranged stations for cookie and photo decorating, jewelry and card making, tissue paper stained glass art, and of course care packing making. Other upcoming activities include a special Valentines Day Troop Appreciation Dinner for Joint Base McGuire-Dix-Lakehurst in New Jersey and an event in Tennessee for individual augmentees. Freedom Alliance will be sponsoring materials for printing photos and making frames to send to deployed service members. Holidays, like Valentines Day, are an important time to let our service members know they are not forgotten, but our support is needed year round. If you know of a service member who would like to receive a care package, please Click HERE and complete the Freedom Alliance “Gifts from Home” form. Be sure to include their military mailing address and a valid email address. We will contact the service member via email before any packages are mailed.